Biologist Lena (Natalie Portman) joins a mission into Area X, an area where nature shows strange behavior that nobody is able to explain, after her husband (Oscar Isaac) went missing there. The expedition, led by Dr Ventress (Jennifer Jason Leigh), is supposed to find out more. Anything they can, really. The five women – Lena, Dr Ventress, Josie (Tessa Thompson), Anya (Gina Rodriguez) and Cass (Tuva Novotny) – set off and are soon faced with phenomena that are even stranger than anticipated. I was very excited about Annihilation, having recently read the books and loved them and having mostly enjoyed Garland’s previous films. But I have to admit that Annihilation was a bit of a let-down for me. It might have been different if I hadn’t read the books, but I’m not sure. Acceptance is the third novel in The Southern Reach Trilogy by Jeff VanderMeer. Area X is still as much of a mystery as it ever was. But there is hope in one final expedition to at least gain some insight. Or stop the Area from growing. Or maybe the answers lie in the past of the Area, in the time where the lighthouse was still being taken care of and the Southern Reach didn’t exist yet. Acceptance is an excellent conclusion, or rather lack of conclusion for the trilogy that ends as weird as it started. Authority is the second novel in The Southern Reach Trilogy by Jeff VanderMeer. John Rodriguez, who likes to be called Control, has recently taken over the Southern Reach agency. It’s a disorienting agency and Control has trouble getting his bearings. People seem to keep things from him. His handler, called The Voice, isn’t happy with him and his progress. His assistant Grace might be plotting against him. And anyway, what is the deal with Area X in the first place? Authority gives us an entirely different perspective on Area X than Annihilation did and I loved it in all its fucked-up weirdness. 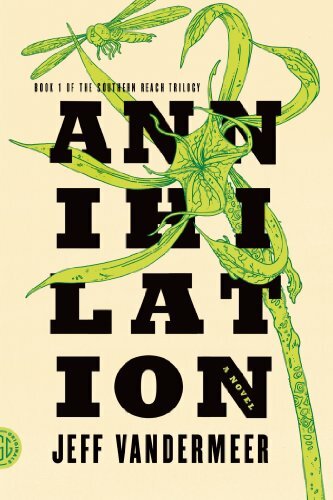 Annihiliation is the first novel in The Southern Reach Trilogy by Jeff VanderMeer. A biologist, a psychologist, a surveyor and an athropologist cross over the border into Area X. Strange things are going on there and the four women are tasked to find out more about the goings-on inside the area. They are the 12th expedition already. The biologist’s husband was part of the 11th. So far, no expedition has returned as they have left, if they returned at all. Something weird is going on there, as the small group quickly learns. Annihilation is an absolutely strange read that I’m still not entirely sure I actually understand but that was utterly engrossing – whether because or despite of that, I do not know. I just know that it gave me goosebumps more than once.